The Academy would like to recognize Giovanni Pivirotto and Joanne Bazarian for their love of yoga and Oscar-nominated short films. Joanne and Giovanni own the Perfect Balance Yoga studio and the JoGio Homes real estate firm with London Properties. 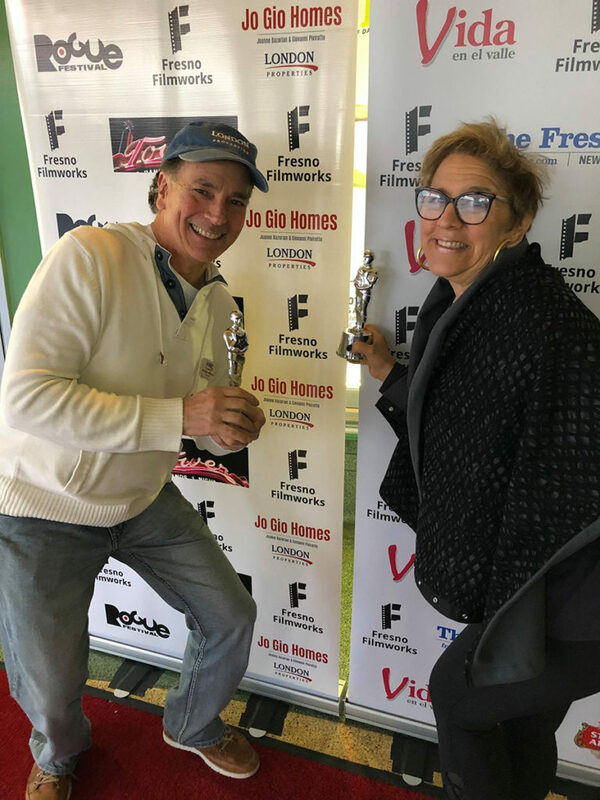 They are longtime supporters of Fresno Filmworks, sponsoring the movie “Lucky” in 2017 and the Oscar-nominated short films in 2018 and 2019. Joanne: Gio and I both grew up in the Central Valley — he in Merced and I in Dinuba, respectively — and we both then moved away. He moved to the tropics and I moved to the East Coast and then came back, then moved up to the Bay Area and came back, and we met in 1999. Gio has a background in the travel business. My undergrad degree is in theater, and my graduate work is in psychology and human behavior, human services. I taught college for many years, I was a corporate headhunter/recruiter, and then we opened up the yoga studio. And now we sell real estate. Gio was also in management at American Airlines for a long time. We evolved from many different things to now doing the real estate and owning Perfect Balance. How and why did you first get involved with Filmworks? Joanne: For the love of film and the love of The Tower Theatre, and being able to see wonderful independent films that you don’t see here. Living in the Bay Area, there’s wonderful opportunities to see fabulous films, and Filmworks brings that to us here in the Valley, which is super special. We’ve always gone as much as we could to support them, and to keep them doing what they’re doing, and to keep the films going. Giovanni: We’ve been attending Filmworks viewings, watching the movies for years and years. I think they were looking for sponsors and I thought, hey, let’s jump in there. We’re happy to support this, because we want to see this continue. We had the ability to help, so we did. Why did you decide to sponsor the film “Lucky” and also the Oscar shorts? Joanne: Because Harry Dean Stanton’s character did yoga in “Lucky,” and Jefferson thought it might be a good fit, and we did too. And the shorts, because I think it’s fascinating that you can watch the Oscars and you can actually have seen the movies that have been nominated. Unless you have a Filmworks in your neighborhood that does something so fabulous like that, you’re watching the Oscars and it’s, oh that looks like a good movie. I always tell people at the yoga studio when I’m promoting Filmworks, be the star at your Oscar party by having already seen the movies. Giovanni: I think that was probably the spark with “Lucky,” that there was some yoga involved. It was like, hey, yeah, this is a great tie-in to our yoga studio, which we’ve had for 17 years now. And so that was beautiful. Right now we’re supporting Filmworks as we also sell real estate, so that’s our primary livelihood. We just want to be involved any way we can, if we can support it and keep helping to bring great films to Fresno. Are there other ways you support Filmworks now? Joanne: By always promoting it and sponsoring, and by attending when we can, as often as we can. Giovanni: We promote Filmworks at our studio, in front of hundreds of students. We remind them that there’s monthly showings coming up, we remind them about the annual Fresno Film Festival, and we encourage people to go. So we’re constantly talking about it, to get people to go. We want to see people fill the seats. I think it’s continuing to build, and hopefully we’ve played some small role in that. Joanne: I don’t know, watching “Fantasia” when I was 5, or “It’s A Mad, Mad, Mad, Mad World” when I was little. I was always loving the movies. I remember when I was young and we would come up to Fresno and go to one of the old movie houses like the Crest, and I remember seeing “Funny Girl” and “The Sound of Music.” It was like an outing – you’d come up to Fresno, it was so fun. You’d get all dressed up to go to the movies. So I’ve always loved the movies. It’s a wonderful escape, it’s a great way to take your mind off what’s going on and let yourself be involved in another dimension. Giovanni: When I was a kid about 11 or 12 in middle school, they had a summer school program with some electives. I chose to do stop-frame animation cinematography. I’d never done that before. They taught us to do stop-frame animation, like clay animation. We also had to come up with our own film ideas, so I came up with a couple. One idea was, we used all the other kids in the class as race cars. We scooted around the tetherball court on our bottoms using stop frame animation. It was only a couple of minutes long, but of course it took a very long time to make that film because it’s frame by frame. And I found out a few years later that they were continuing to use the films that I produced to teach other kids in that same class for the next six or seven years! So that was kind of my introduction to, my little tiny bit of filmmaking that I’ve done. I was just fascinated with films. Like everybody, we all love movies. I appreciate the hard work and effort that goes into making a film, the many, many pieces of the puzzle that go into making it, the directors, the people that write, the dialogue, the cinematographers, all these different aspects, it’s just a remarkable artwork. Joanne: Too numerous to count, so many good ones. I don’t think I’ve been disappointed at a movie at Filmworks. They’ve always been really awesome selections. And The Tower Theatre is the perfect place for them to be. Every movie has something to offer. Giovanni: Going back to my early days, any time I see the animated films. I love animations. Love the stop-frame animations. The Oscar shorts are the perfect vehicle for me to sit down and watch cartoons. Joanne: I love documentaries, I love history pieces. I love comedies, romantic comedies, so there’s a lot of different genres of movies that we enjoy. And I’m lucky enough that Giovanni likes a good rom-com too. Most men think they’re chick flicks but he actually enjoys them, so that’s nice for me. Giovanni: I like things that expand what we think is possible. So I like science fiction, I like “Harry Potter,” I like “Star Wars,” I love “Lord of the Rings,” I love those kinds of films that are a little on the sci-fi, a little on the action side. But I love good storytelling about real life too. I enjoy movies that tell a story of things that are really happening in the world, that are happening to people. I’m also really interested in documentaries that involve the environment. I’m very concerned about the environment and the health of our planet, and my love of animals and all creatures that live with us here on the earth. And romantic comedies – there’s that English film that’s so prevalent around the holidays, “Love Actually.” Great film, it’s a classic film now. It’s going to be one of those films that people will be watching for decades. Joanne: If you love movies, and you want to see them in a great environment, go to Filmworks. The board spends time previewing and curating all these movies to bring you the best that they can find. We are so lucky here in Fresno to have access to The Tower Theatre, which is a beautiful space to watch them, and to enjoy these movies we normally would not see, ever. That’s what I think is really important, we have this opportunity and this privilege to be able to watch these movies – and it’s so reasonable. When people say there’s not much to do here in Fresno, I go, yes, there is! Filmworks is awesome. We promote it heavily, and I always share the posts on social media, all the time. Giovanni: You have an opportunity to sit in a beautiful theater that is a venue where they show films you will not see anywhere else on the big screen. You’re sharing that experience with a room full of people that are as enthusiastic as you are about that kind of film. And the films are of such high quality. You can sit in your home and look at your computer screen or sit in your living room, but you just don’t quite have the same experience when you go out into a theater like that. And it’s just something that I think everybody has to experience, and some people probably never have. What other local arts organizations do you contribute to, and why? Joanne: We try to go to ArtHop often. We try to support local artists’ shows. Sometimes we’ll do local artists’ shows at the studio. I think that’s important, to help people who have great works right here in the Valley and in Fresno. We support the College of Arts and Humanities at Fresno State, we’ve donated to them, to Arts In Motion, and their programs so they can give scholarships. Giovanni: We used to be part of the ArtHop tour years ago. The studio was in fact an art gallery. We hung art on the walls, and every six to seven weeks we would change artists. The whole interior of the studio was an art gallery, basically. Joanne: We like to hike, snowshoe. I’m learning to play mahjong. We love to travel. Giovanni: I’m a surfer and an outdoor enthusiast, so anything outdoors is fine. Love hiking, love being near the water, swimming in the open ocean. I haven’t done that in a while but I enjoy that. When you sit out in the ocean and you have to read the surface of the water, you have to read the waves coming in, you have to wait, you have to know how to be patient, and you have to time it just the right way. And there’s no guarantee you’re going to have good waves. Some days you go out and it might be really flat, or might be windy and conditions are not good, and some days you go out and it’s absolutely perfect, the waves are big, you have a good time. But there’s something about being in that natural flow of things, not trying to control it, that makes surfing really special. When you get out and you drop down the face of a giant wave, and you’re completely at the will of Mother Nature, all you can do is hang on, there’s something really special about that.